In 2012 Phired Up Productions launched a major initiative to understand growth trends within the fraternity/sorority industry. This project was the first of its kind and scale. The goal is simple and immense: over time gather vital growth-related data from every college and university that hosts fraternity/sorority life. Tuesday, December 13th, 2013, marked the release of the second year of the Campus Growth Survey’s findings. 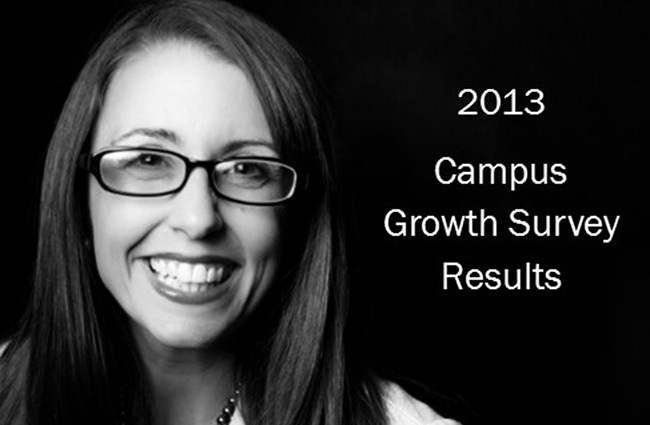 Download the full 2013 Campus Growth Survey Report here. The 2012 (inaugural) report is available here. The 2013 campus growth survey yielded 363 responses from 352 unique campuses. That is about a 40% response rate — an increase in response from last year by 10%. The profile of the average campus respondent included 24 total fraternity/sorority chapters. The average breakdown of the 24 total fraternal groups includes: 10 IFC (Interfraternity Council) groups, 6 NPC (National Panhellenic Conference) groups, 4 NPHC (National Pan-Hellenic Council, Inc.) groups, 2 MGC (Multicultural Greek Council) groups, and 2 professional fraternal groups. On average, campuses host 1 NALFO (National Association of Latino Fraternal Organizations), 1 NAPA (National APIA Panhellenic Association), 1 local, and 1 “other” group. The average cost to go through sorority (Panhellenic) recruitment is $33, and for fraternity recruitment (IFC) the average cost is five dollars (though 68% of fraternity communities do not charge at all for recruitment sign up). It was reported that 47% of campuses support open, year round recruitment for IFC groups. Additionally, 30% of campuses practice deferred fraternity recruitment. About 76% of campuses allow for time in new student orientation for new students to be educated about fraternity and sorority life and about 55% of campuses also educate parents. On approximately 39% of campuses, new students are allowed to “opt-in” to receive information about fraternity and sorority life before coming to campus. Of those reporting, 76% of campuses are using fully-structured recruitment for NPC groups, most of whom recruit in the Fall semester. On average,15% of women that received a bid through a formalized recruitment process did not initiate into a chapter. Among those reporting, a total of 225 (60% of all efforts) successful or highly successful expansion/extension efforts were held on campuses since the last Campus Growth Survey Report. 77% of campuses have some type of fraternity and sorority housing arrangement. On average, fraternity and sorority professionals spend 78% of their time working on fraternity and sorority life exclusively. Approximately 40% of campuses are open for IFC expansion, 24% open for NPC expansion, and 46% open for NPHC expansion. For MGC groups, 39% are open and 25 and 30% respectively are open for NAPA and NALFO expansion. In total, 53% of respondents indicated that they are aware that alcohol is being used to some degree during the recruitment processes on their campus.